Washington D.C.-based Ethiopian activist Obang Metho says that Ethiopian and Rwandan dictators have been allowed to terrorize their own people because they provide troops for the U.S, War on Terror. Metho is a founder of the Soldarity Movement for a New Ethiopia. KPFA Weekend News Anchor Sharon Sobotta: Two hundred delegates from African governments and institutions met in Kigali, Rwanda yesterday for a symposium on “democratization and development.” The symposium was organized by the Meles Zenawi Foundation and the African Development Bank. Ethiopian Prime Minister Meles Zenawi’s successor Hailemariam Desalegn joined Rwandan President Paul Kagame in Kigali, where both spoke of the primacy of state power and African agency in development. 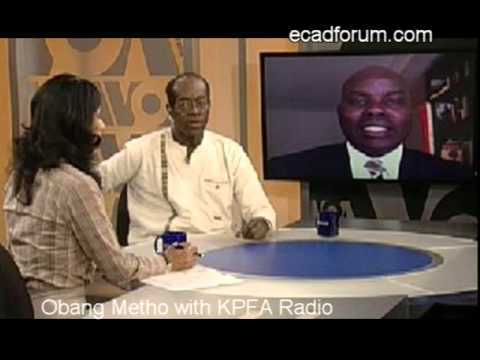 Washington D.C.-based Ethiopian activist Obang Metho spoke to KPFA’s Ann Garrison about what was wrong with this picture. Obang Metho: Thank you very much for giving this opportunity. The whole picture is wrong. The whole picture wrong being that Paul Kagame and then the former Prime Minister of Ethiopia, Meles Zenawi, these two gentlemen . . . we cannot talk about them and say that they can bring any new things to Africa. Why? Because these are two men who came to power, not by the ballot by the bullet. And if you look at it, these are people also who’ve been in power for long. Meles, he died in power. So the whole thing is wrong with the picture. Like they were talking about development democracy. Where is the democracy? Ethiopia is a country that, in just the election they had in May this year, the government won by 100%..
KPFA/Ann Garrison: I remember that. They won every single seat in Parliament. Now, are you saying that both these governments are minority dictatorship, Rwanda, dictatorship by the 14 percent Tutsi minority, and Ethiopian dictatorship by the 6 percent Tigrean minority?. KPFA: It seems that the United States military partnerships with Rwanda and Ethiopia, based on Rwanda and Ethiopia’s willingness to cooperate with American forces insulates both regimes against criticism from the West. OM: Correct. Correct. Yeah, because if you look at it now, Obama went to Ethiopia last month. When he was in Ethiopia, the speech he gave was that Ethiopia had the top soldiers. He went there for a specific reason. He said Ehtiopia had the top soldiers. So, in other words, instead of sending the Marines over to die in Somalie to fight Al-Shabab or to fight these which they call the terrorists, actually they send the Ethiopians there, pretty much like a contract. So, in the name of security, the Ethiopians work for the West for what they call War on Terror, but these people are actually known for terrorizing their own peoples. And then Obama called Burundi, the election there, illegitimate, or not credible. Which one is that? The one that claims to win by 67 percent, or the one that claims to win 100 percent? But in the long run, this thing will explode. So this kind of thing, where you side with a dictator and exclude the people, that will sooner or later haunt.. If violence erupts in Ethiopia, and Ethiopians kill each other, that will be the legacy of Obama. There’s no doubt about it, because he’s the one who has supported this group that has isolated itself from Ethiopians.